Welcome to The PostalVision 2020 Initiative (PV2020), where we are Reinventing the American Postal Ecosystem of the Future. 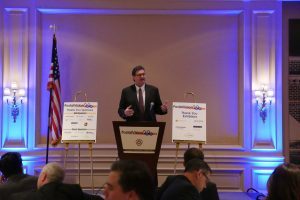 Since 2011 we have been engaging stakeholders from all across the postal platform and beyond in a critical conversation about what future generations should have in the way of Postal Services in America. There is a lot at stake in all this! No other commercial brand or enterprise can claim every American citizen and resident as its customer. No other physical distribution network comes close to providing as many access locations (30+ thousand) or reaching as many business and residential delivery points (150+ million). We all depend upon the USPS in one way or another. We are all its stakeholders and as citizens we own it. And, we are collectively responsible for its success, or its failure. PV2020 is designed as a forum where we can all talk about what we think our nation needs in the way of Postal Service in the future and discern what sort of public platform design should support it. Five principles distinguish The PostalVision 2020 Initiative and collectively comprise its ethos. 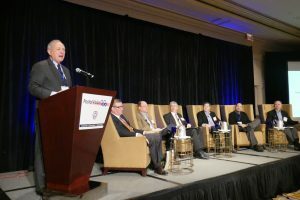 PostalVision 2020 looks beyond the horizon, far into the future, envisioning what the American postal ecosystem will look like well into the 21st century. It conceives and projects what future generations will want and need in the way of “postal services” and considers what roles our government and the private sector should each play in providing them. PostalVision 2020 recognizes that the United States Postal Service serves as the heart of our nation’s mail delivery infrastructure. It pumps its lifeblood throughout a vast circulatory communications and distribution ecosystem that touches every household within our borders and extends far abroad through partners. As a large $60+ billion corporate entity, it is still a relatively small business compared to the $1+ trillion industry that it supports as well as depends upon. Mailers, shippers and receivers, third-party service providers, vendors, and hundreds of thousands of hard working USPS employees act as critical links in the value chain that defines our nation’s vast postal ecosystem. PostalVision 2020 is an independent, inclusive and strictly non-partisan cause. By ensuring that every ecosystem participant has a voice, it assures openness and objectivity. PV2020 will not lobby or take its own stand on any particular issue, but will endeavor to ensure that every position may be heard. Individual opinions of PV2020 team members will frequently be expressed but they will not speak for the PV2020 Initiative itself. Sincere and responsible opinions expressed in earnest by rate-paying mailers and shippers as well as by non rate-paying receivers; by USPS management as well as by labor unions; by third-party service, product and technology providers; by government regulators and policy makers; by industry thought leaders and academic experts in the U.S and abroad; by private sector innovators, entrepreneurs and investors; and by virtually any stakeholder with something of substance to offer; are all welcomed! PostalVision 2020 recognizes that the ecosystem has already begun to undergo radical disruption and irreversible structural change resulting from the rapid adoption of digital technologies. As traditional letter delivery product requirements contract, hybrid mail and ecommerce product offerings expand. And, there can be no turning back or standing still. The PV2020 Initiative appreciates the influence of these dynamic forces, anticipates the rapid rate of change and seeks to lead the transformation rather than follow it. And, PV2020 is now willingly if not eagerly “paving the pathway to a new postal paradigm”. PostalVision 2020 is designed to provoke a lively dialogue on change. Out of opinionated yet earnest and reasoned conversation, PV2020 seeks to stimulate new approaches to problem solving while awakening collective creative and innovative thinking about opportunities and inventions. Through discovery, PostalVision 2020 seeks to inspire constructive action for the postal ecosystem of the future.